The Snider is not all that well known these days. But yet, once people see it at the range belching smoke, they often remember a friend or family member that had one or even hunted with one. Especially in Canada since they were the standard issue firearm for our troops in the early stages of our Country after Confederation. They were also carried by the North West Mounted Police on their famous march westward. They are less well known in the United States but even so, there are quite a few very enthusiastic Snider shooters. Some of these shooters are even supplying the world's market now with components for the Snider! Even into the 20th century, the Snider was used in some capacity by many of the Commonwealth Countries troops and police agency's. Here in Canada, many were converted into training carbines used by Cadets. 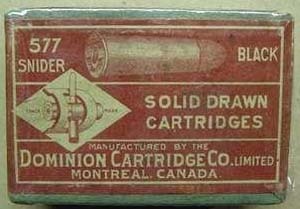 Commercial ammunition was available, some even produced with smokeless powder, up into the 1930's (and maybe even up until the 2nd World War?) here in Canada. In Britain, Kynoch continued to produce ammunition until quite recent times. 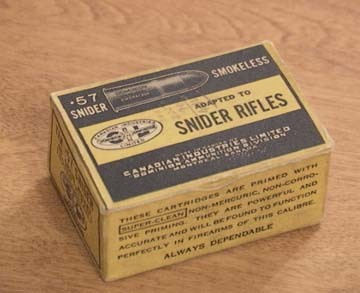 In 1967, the Snider was used in Service Rifle competitions at Connaught Ranges in Ottawa (The Canadian equivalent to Camp Perry or Bisley) and most competitors that did not RELOAD their Kynoch cases were shooting this Kynoch ammunition. Today's shooter who wishes to continue to make noise with a Snider may not have quite as many components available LOCALLY to keep their ammunition supplies up. But thanks to the Internet and the ease that people can purchase goods worldwide these days, gathering reloading components for the Snider is really not that difficult. Follow the link buttons at the top and bottom of these pages and see how my friends and I keep our Sniders fed with ammunition that is really quite inexpensive yet can be quite accurate!